Sidney is a delightful young woman, and she and Jay work well together. They are very glad that their wealthy friend Brooke has insisted that Sidney and Jay lead this tour. The only problem is that once they are in India, they discover that all the arrangements have already been made and they aren’t needed at all. Instead, Brooke lets them know that she wants them to discover which of her friends is a murderer. The descriptions of India and Nepal are fantastic, and the reader quickly becomes another member of a fantastic tour. The sights, sounds, smells, and even tastes of these countries is conveyed in a vivid and exciting way. And the characters on the tour are certainly very different and each seems to have secrets they don’t want to reveal. Mysteries abound in this exotic location, especially after one member of the tour dies. This is a fun novel, but I do have to admit that I guessed the murderer early on, although I didn’t know all the details until the end. Personally, I would have preferred a bit more mystery and then, when the action did heat up quite dramatically, everything was resolved rather too quickly for my tastes. However, I learned a lot about countries I’ve never visited and the atmosphere was very well done. 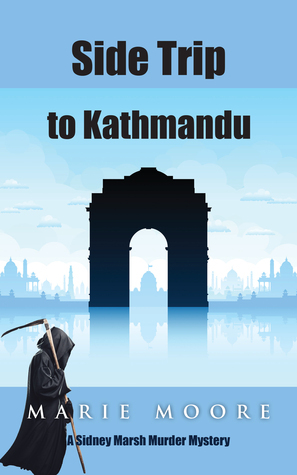 Readers who enjoy a cozy mystery, especially one that takes them to new locations, are sure to find Side Trip to Kathmandu to be a delightful experience.